Directions: Cutler City is now the most southern neighborhood of Lincoln City. Driving south after crossing Schooner Creek look for the Beach Dog Cafe on the left, and the Freed Gallery on the right. The bulk of the town is behind gallery close to the bay. Cutler City, Oregon is one of the five communities that combined together on March 3rd, 1965 to form Lincoln City. Siletz Indian, Chief Charles “Charlie” DePoe, owned the land along the southeast edge of Siletz Bay between Schooner and Drift Creeks. In 1913 he sold the land to friends George and Mary Ann Cutler. They established a townsite on July 4th to build a resort community and sold the first lot to Frank Gibbs of Portland Oregon. He built a summer house that year and the area became known as Gibbs Point. The Cutlers also built a cabin there, but George Cutler died in 1914. Mary Ann Cutler moved back to Dallas Oregon in the Willamette Valley, and her son Arthur Cutler inherited the property. He developed it into a fairly decent resort community with small cabins, but the area took off in 1927 when the highways were finally built. The Siletz Bay Auto Camp became a popular destination for tourists from Portland and beyond. 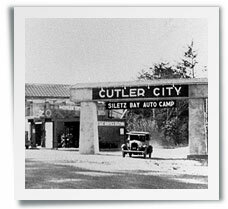 The town officially became Cutler City in 1930, likely when the Post Office was established on April 14th of that year. Jacob H. Boomer was the city’s first Post Master. Cutler City soon became a popular destination for it’s ample number of colorful wild rhododendrons. The North Lincoln Rhododendron Society, organized in 1938, selected Cutler City as their Rhododendron Capital. The Society held Rhododendron Days there from 1938 to 1941 to celebrate their blooming. After World War II much of the remaining land was cleared for housing, bringing an end to the Rhododendron Days as the wild rhododendrons were destroyed. By the time the 1960’s rolled around, the need for consolidation of the five communities north of Siletz Bay became apparent so that community services such as sidewalks, police, fire, hospitals and most importantly a water department could be formed. Controversy over the matter led to a failed attempt to consolidate in May 1964. The second attempt in December of the same year was successful. Public input via a contest was solicited and the name of Lincoln City barely won out over Surfcity. Lincoln City was incorporated on March 3rd, 1965 and the five communities of Cutler City, Delake, Nelscott, Oceanlake and Taft were no longer separate entities. The Cutler City Post Office closed on September 24th, 1965.